Canadian doomy sludge rockers THE WHITE SWAN are excited to share the second single from their upcoming new EP, “Touch Taste Destroy”, due September 7, 2018. 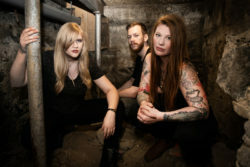 While “sticking to the core thickness and melodic resonance” (The Obelisk) that THE WHITE SWAN are known for, the new track “Inamorato” takes the EP to the next level. Listen to “Inamorato” now here: https://www.youtube.com/watch?v=uGAuZBhgbN8! THE WHITE SWAN will hit the road this Fall as they embark on a series of headlining dates across Eastern Canada stretching into the Midwest U.S..Catch them at one of the below shows! Zachary Quinto is known best for playing the roles of Sylar in the fan-favorite series “Heroes” and also Spock from the “Star Trek” franchise reboot. He plays the role of Dr. Oliver Thredson in the FX hit series “American Horror Story: Asylum”. In a recent episode of the show it was revealed that Ounito’s character is in fact the serial killer known as “Bloody Face.” Media Mikes had the chance to speak with Zachary recently about the role and how it has differed from that of his role in season one of the show. Adam Lawton: How has playing this seasons character differed from other characters you played? Zachary Quinto: I think any time an actor revisits territory that they’ve been in before, it can be a source of trepidation, as it was for me. But part of the reason that I loved what the opportunity stood for was that I got to know, going in what/who my character was going to be and I got to really build something. With “Heroes” that character was built before I was ever attached to it. There were eight episodes of anticipation that were built before you met “Gabriel Gray” I had no participation in that. So for me, it was really exciting to get to go in having all the information, and actually be part of the process of creating a character. That, to me, was a difference. This role/character is self-contained and it was an immersion that I’m not going to be repeating or carrying on for an extended period of time. It was something I got to go do and contribute and benefit and grow and learn, and then be on to other creative pursuits and that, I think that is an environment in which I thrive. So I was really excited about all those elements. AL: Were there meetings where you actually talked about the direction of your character? ZQ: Yes, I had a few conversations with Ryan and Brad before we started. Ryan and I had a couple of connections about what he was thinking and I had some questions and had a chance to contribute to what I would like to see. But once they got going, it’s like their engines just drive them and all of us forward in such surprising and unexpected ways, so the vast majority of that comes from them and actually bring it to life. That’s how I see it. or find it more of a challenge? ZQ: It depends on the scene. There are different levels of preparation for different scenes in different kinds of work. So I have a combination of things that I do. I usually just find some solitude and some quiet in a little corner of the set where there’s not a lot of traffic and not a lot of people around and do what it is that I need to do. I listen to music a lot, if I need to get into a particular emotional space, I use that and just other sort of stretching, just breathing, taking time to mostly be quiet and find that kind of stillness. I think that’s important. I love playing characters that go to extreme places and I love to explore different kinds of psychological landscapes, so it is ultimately a kind of fun, but it’s also complicated and colored by the depth of the nastiness of it at certain times as well. That can be a challenging part. AL: Did your friendship with Sarah Paulson have any effect on how you reacted in the scenes with her? ZQ: I have a respect for Sarah as an actress, but it’s a rare and unique opportunity to show up to work with a really good friend. Oftentimes, friendships are formed on set and through these kinds of experiences. It’s even a richer experience when you already have that foundation of friendship. So there’s an implicit trust and sensitivity to each other and our needs and our instincts and our individual process. It’s really a remarkable gift in a lot of ways. We also are able to have more fun, I think, and laugh at a situation a little bit more. There’s less awkwardness to cut through. I think it strengthens the connection that the characters share, whether it’s friendship or torture or hostage, whatever it may be. I love going to work anyway, no matter whom I’m working with, but in particular with Sarah, I think she’s doing such wonderful work on the show that I also just love watching her character and the journey that she’s taking. She’s gone to so many extreme and challenging emotional places, and done it so beautifully and dynamically. I just think her work is so incredible, so it’s been a joy for me, really, this whole experience. AL: We have seen “Bloody Face” in a few present day scenes. Will we find out whether present day “Bloody Face” is also “Thredson”? ZQ: Wouldn’t that be cool? Yes, you’ll find all that out. It was pretty freaky and cool. I mean it’s really driving to a point. The storytelling structure of “American Horror Story: Asylum” I think is really going to pay off in a really big way. So I think all of the questions that people have, and that the episodes that are airing right now are generating, will definitely be answered. That’s my instinct, at least, having read up through almost the end now. Star Wars Detours™ is an animated comedy that explores what daily life is like in a galaxy far, far away. There are no Empires striking back or attacking clones here. Instead, Star Wars Detours focuses on the universe’s regular folks and their everyday problems… which, to be fair, do frequently involve famous bounty hunters, crazed Ewoks, and even a Dark Lord of the Sith. Welcome to Star Wars: Detours: the other side of the stars, between the wars. Star Wars Detours™ was revealed during Star Wars Celebration VI last month in Orlando, FL. The new animated series is from the team behind “Robot Chicken”. There is amazing line-up for voices on this show including Seth Green, Catherine Taber, Dee Bradley Baker, Joel McHale, Donald Faison, Breckin Meyer, Seth McFarlane, and Jennifer Hale. The show should be hitting Cartoon Network in 2013.